What are the best ways of capturing and drawing on older people’s experiences of care to improve my practice? We are all used to giving our opinion on a range of things: restaurant meals, trips we take or the latest gadgets. But when it comes to our care experiences we may be more aware of what we say and who we say it to because of the possible effects of sharing our experience. We may worry that what we say will affect our care and treatment in the future, especially if we have had a negative experience. However, it is often the not-so-good experiences we need to hear because of the essential learning and improvement opportunities they provide. It is not irrational for older people to worry about sharing negative opinions. Consider those in your care who are vulnerable and who depend on you: when exploring their experiences of care, honesty and openness could be suppressed if staff attitudes and behaviours have been poor. When seeking feedback on people’s experiences of care, trust and respect are crucial. Asking for feedback is easy and it can be done informally, for example through a survey. 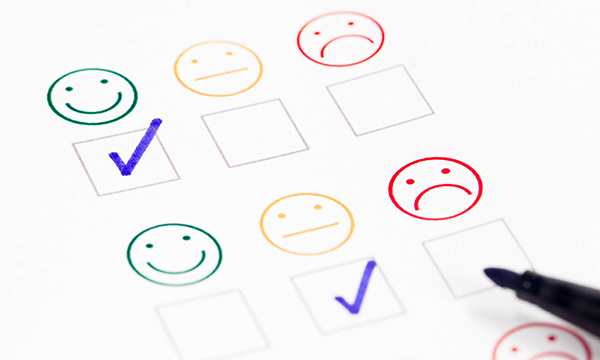 Sometimes the anonymity of a survey is enough to gain insight, but face-to-face surveys are useful too, because experiences can be explored in more depth. However, the level of familiarity between parties can be a barrier to the truth. Authenticity builds trust, and an independent interviewer can provide authority and impartiality. Again, think of your audience: older people may have sensory impairments, difficulties with reading and writing, or cognitive impairments. These could challenge their interpretation and comprehension of the questions they are asked, and make them uncertain about how to respond. In these cases, older people can use symbols or images to rate their experiences. The most important thing you can do is to respect and value all feedback – every sentence spoken, every word written or image ticked. Make your respect known by sharing and showing how much you value feedback – how you deal with poor feedback is as important as how you celebrate good feedback. Storytelling is a great way to elicit care experiences. Stories can be captured in writing, and through sounds, songs, objects and pictures. It is easier to balance good and poor experiences in a story, and share them with people who are more familiar with you. Life story work has an established tradition in dementia care settings, where past life experiences influence and enhance communication, as well as participation in care (Thompson 2011). A great way to find out about care experiences is by sharing stories and talking about what was good or bad. The stories can reveal what is important to a person as well as what can be improved. Usually, the person will tell you how improvements could be made, but be conscious of the fear they may have of appearing ungrateful. Spend time building a rapport and ask openly how experiences could be made better. Honesty, openness and trust-building go a long way to gaining valuable and meaningful insight into care experiences. Daly L (2017) Effective communication with older adults. Nursing Standard. de Vries K (2013) Communicating with older people with dementia. Nursing Older People. Thompson (2011) Using life story work to enhance care. Nursing Older People.